Baked crab cakes served with a yogurt sauce for a lighter and easier crab cake recipe. A New Year's celebration classic! Stir together all ingredients for the yogurt sauce. Set aside. Place crackers in sandwich bag and crush with hands or rolling pin. 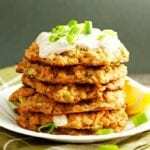 Make the crab cakes by whisking together mayonnaise, greek yogurt, mustard, worcestershire sauce, old bay spice, and salt. Whisk in the egg. Gently break up crab meat. Gently stir crab meat into the mixture. Gently stir in crushed crackers. Spray a baking sheet with cooking spray. Form 8 crab cakes, arrange on baking sheet, and spray with cooking spray. Bake for 10 minutes, flip, then bake until golden brown, about an additional 5-10 minutes. Serve with yogurt sauce, lemons, and diced green onions.